The Brownies gather around Lanny in the Commissary, waiting to see what’s behind the door. Photo by Ryan Hawk/Woodland Park Zoo. 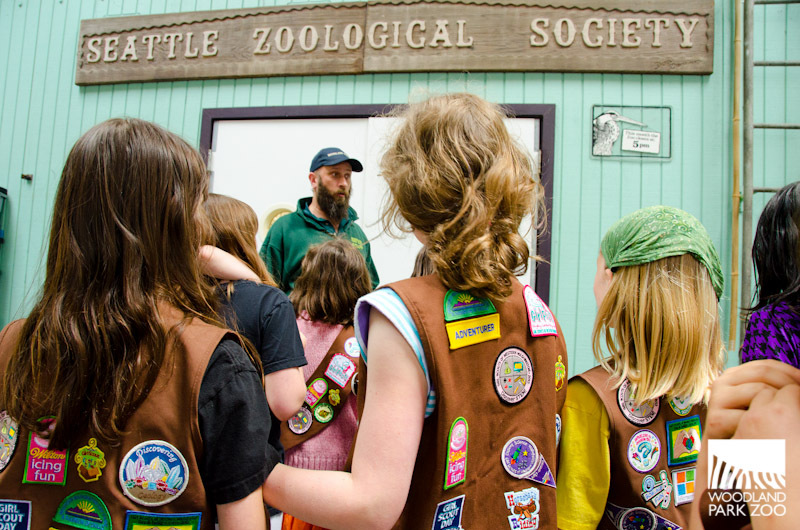 “Do you know what we do at the Commissary?” Lanny Kittleson, the zoo’s Commissary Lead, asked the Brownie troop. “Feed the puppies!” one girl guessed. Well, it’s not exactly puppies we’re feeding with the thousands of pounds of food that come in and out of the zoo’s Commissary each week—it’s the more than 1,000 animals representing 300 different species living at Woodland Park. 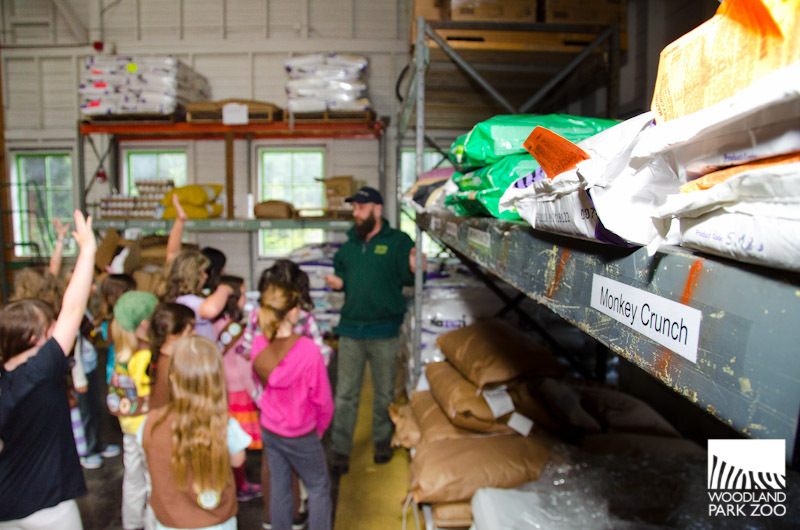 Last week, the 3rd grade Brownie troop from Ballard’s Salmon Bay School had the unforgettable opportunity to go behind the scenes at the Commissary as a special thank you from zoo staff—after all, the 8- and 9-year-old girls donated part of their cookie sales money this year to help feed the zoo’s animals. Lanny rolled up the door to welcome the girls into the grain room. “It smells like cat food!” erupted from the crowd. The girls guess at which animals eat which diets in the grain and pellet room with Lanny. Photo by Ryan Hawk/Woodland Park Zoo. Sure enough, there are bags of prepared food stocked up in this room, not too unlike the kibble and chow you might purchase for your animals. It’s just that these pellets and biscuits have more curious names like Monkey Crunch and Trout Chow. Nothing like some Monkey Crunch to get your day going. Photo by Ryan Hawk/Woodland Park Zoo. The enormous sacks of peanuts caught the girls’ attention, but despite what cartoons would have us believe, the peanuts are more likely to end up in one of our birds’ diet than our elephants’. Peanuts are high in fat and portion control is key when it comes to snack time for the animals. Learning about portioning was apropos, as it was a lesson in math and numbers management that led the troop to this experience in the first place. 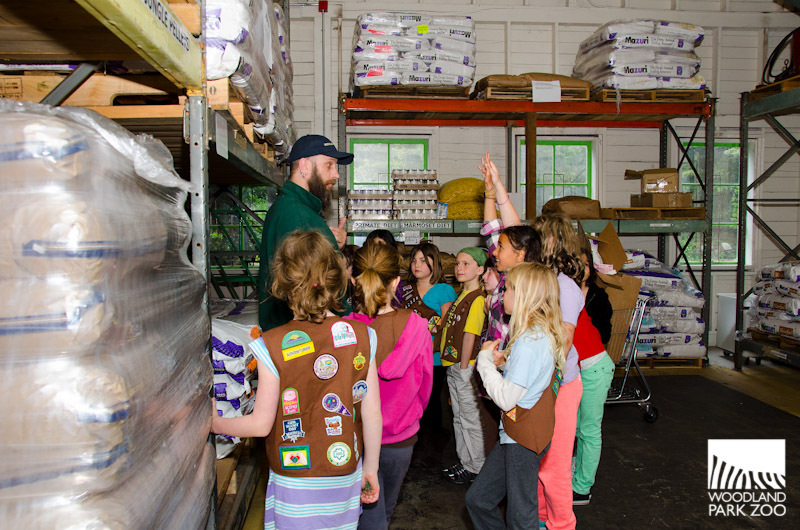 When it came time to sell cookies this year, the troop’s leaders wanted to use the annual tradition as an opportunity to give the girls practice with money management and philanthropy. The troop broke their cookie sale revenue into three buckets—one to save, one to spend, and one to share. Then they voted to use their spend money on cake making and horseback riding, while their share money went to purchase books for their school library and feeding the animals at the zoo. 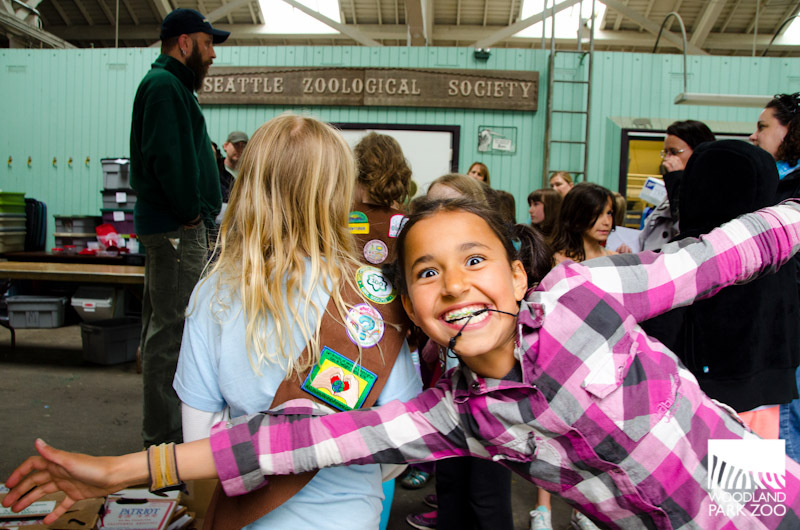 Whether it was the thrill of giving to a good cause, or the excitement of being behind the scenes at the zoo, this Brownie clearly enjoyed her time in the Commissary. Photo by Ryan Hawk/Woodland Park Zoo. After making their way through all the grain and pellets, the girls wanted to see where the meat and produce are stored. So off we went to the bio room where the less shelf-stable goods live. A quick shuffle on the disinfectant pad keeps little Brownie feet clean in the kitchen. Photo by Ryan Hawk/Woodland Park Zoo. 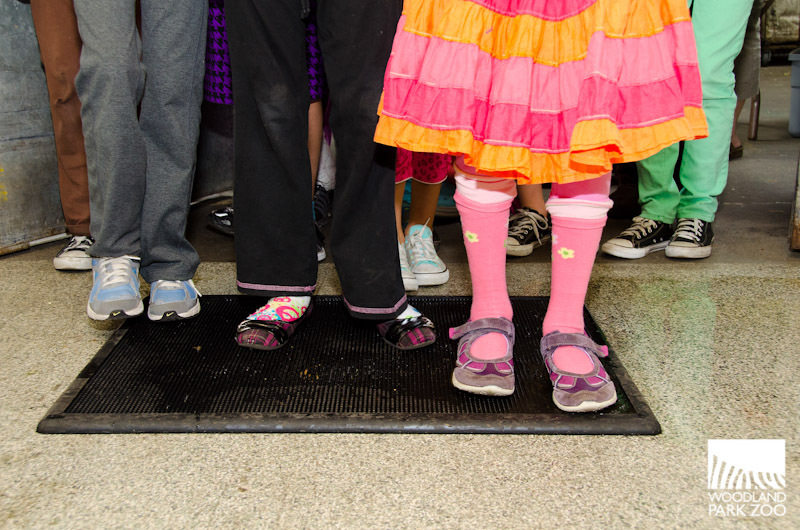 On the way inside, each Brownie had to stomp her feet onto a disinfectant pad to make sure she didn't track any contaminants into the room, just like any keeper or Commissary employee would. The girls quieted to a whisper in this room so as not to distract the zoo staffers who were focused on preparing the week’s meals for each of the zoo’s denizens—it requires a lot of chopping, weighing and portioning, so concentration is a must. But the quiet didn't last long once Lanny brought them to the next room—the freezer where all the meat is stored. 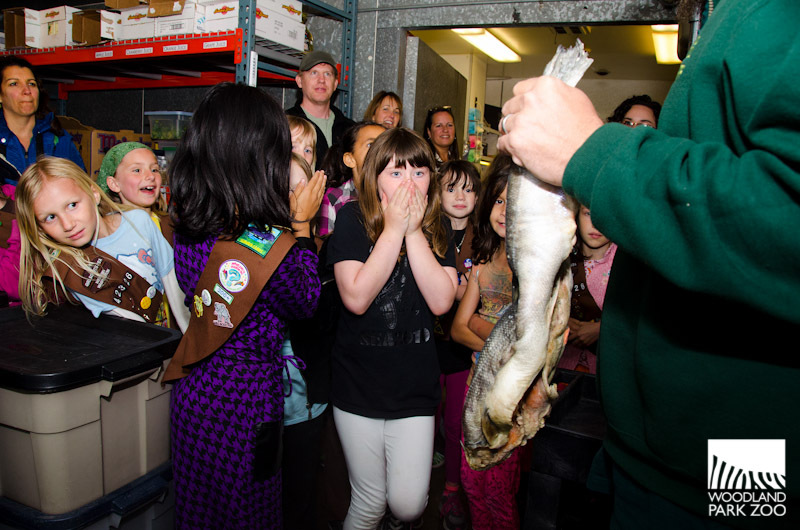 The girls discover what happens to the Pike Place Fish Market’s show fish after they finish famously tossing them around—they come to the zoo to become animal food! Photo by Ryan Hawk/Woodland Park Zoo. It’s hard to say if there were more “Ewwwww!” or “Coooool!” comments in the room when Lanny pulled out fish parts and baggies full of bunnies, rodents and quail. A tray full of rodents gets mixed reactions from the girls. Photo by Ryan Hawk/Woodland Park Zoo. “Rodents are like the popcorn of the animal food world,” Lanny explained. 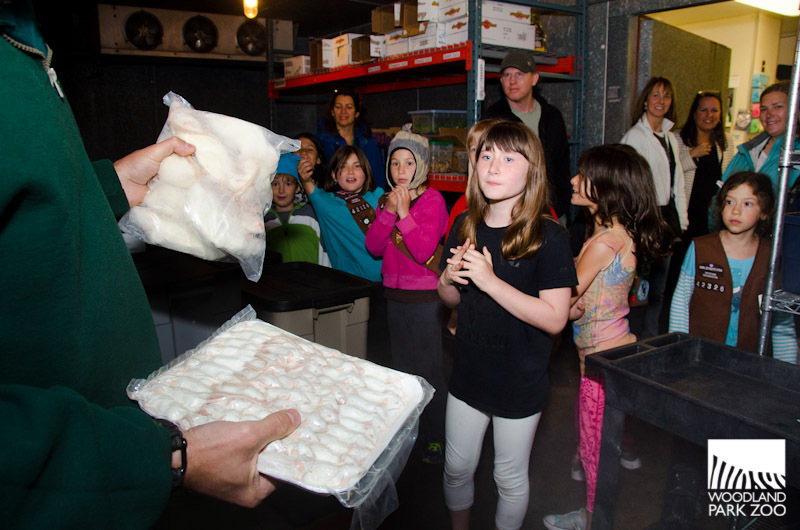 The girls understood that while it might not be the food of their choice, rodent snacks are perfect for the zoo’s snakes, big cats, and other carnivores. Willawong Station is the place to go to see animal feeding in action. Photo by Mat Hayward/Woodland Park Zoo. The girls then made their way to Willawong Station, our bird feeding experience, to bring the day’s lesson in animal diets to a colorful close. 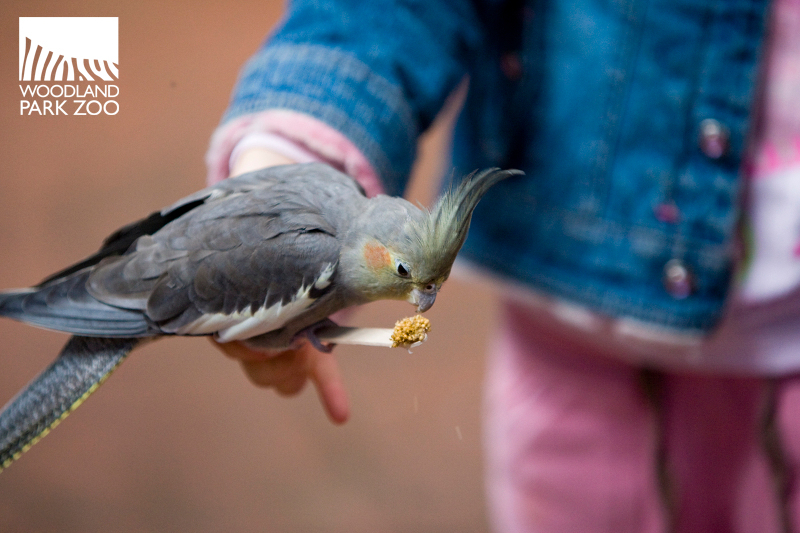 Each Brownie was armed with a seedstick and found herself surrounded by cockatiels and budgies pecking away at the treat. To see where the food starts at the zoo and then where it goes next helped them realize the full impact of what their generous gift has made possible for our animals. 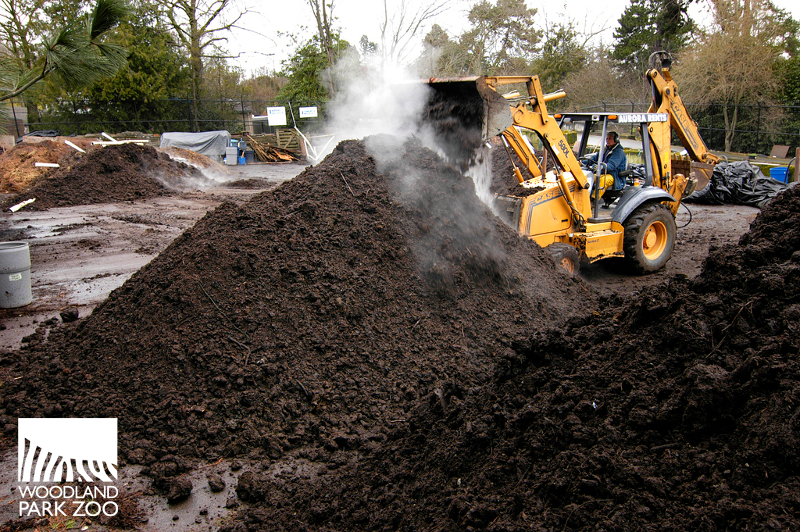 The Zoo Doo yard is where waste from non-primate herbivores gets turned into compost—a favorite of gardeners all over the region. Photo by Ryan Hawk/Woodland Park Zoo. Maybe next time we’ll take them to the Zoo Doo yard to let them see where much of that food ultimately ends up!